As I ran down the stairs and jumped into the train just as the warning alarm began to sound, I realized how grateful I was for Barcelona’s public transportation system. Waking up late, while normally little more than an inconvenience, meant that this morning I would have had to sprint the mile that was between where I was and where I needed to be in less than a half hour. Perhaps if I was readily prepared with my running gear this wouldn’t have put me in such a pickle, but as it was, I was no where near equipped to run the mile to school in time for my 9AM exam. This is where Barcelona’s TMB system comes in handy. With a fully integrated bus, metro and tram lines, Barcelona boasts a highly convenient public transportation system. With one ticket, you gain access to all three modes of transportation, which run the expanse of the city starting early in the morning and running late into the night – all night on Saturdays and some holidays. 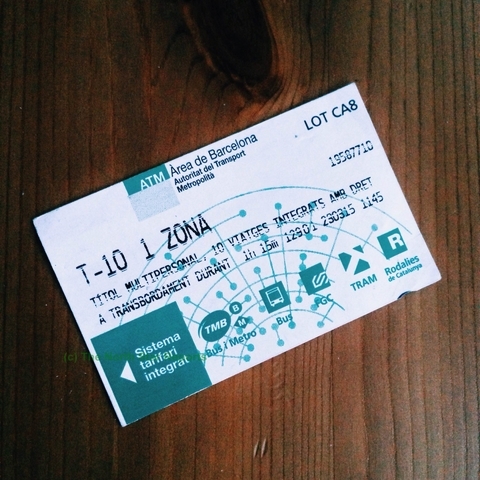 These TMB tickets are also useful when it comes to getting to and from Barcelona’s El Prat Airport, as both the high-speed buses and the trains that run the airport circuit accept the metro ticket as fare. Apart from the three large modes of public transportation, Barcelona also boasts a huge cycling community. On almost any major street you will see strange bike corrals, home to the nomadic ViuBicing bikes that anyone can pick up, ride around, and drop off at will at any station around town once they’ve paid the annual fee. Barcelona streets have separate lanes for the bikers, and these bikers are a constant sight all day every day. Motos and scooters are also highly popular with much easier maneuverability through traffic and ample parking available on the extra wide sidewalks. And if any of these options don’t suite your fancy, there are always taxis to hail. Coming from Duluth, I’ve maybe been in a taxi twice in my life before coming to Barcelona. Here, though, taking a taxi is much more common and it’s definitely an option of ease if you have the extra 10 euro to spend (comparably, the same price as the 10-ride TMB pass). Perhaps what surprised me most in Barcelona was how many people simply walk either part or all the way to their desired destination. A relatively flat city, (much different than the rolling hills of Duluth!) Barcelona offers miles of walkways and parks are sprinkled all over the place. If I was venturing anywhere within a mile and had the time to spare, usually the preferred choice was to walk – not only to save my precious TMB metro rides, but also because it’s quite enjoyable to be outside experiencing the life of the city. Pathways are a variety of old cobblestone or new pavement and especially in the Gothic and Born neighborhoods there are always more side streets to explore. The inhabitants of Barcelona, and in most other parts of Spain, spend a good deal of their existence outside of the house, so by walking your way around town you get the best idea of how the people really live – and isn’t that the whole point? I am sorry to hear about your rush to class! It’s great that you were able to use the public transportation to get to class on time. I found it interesting how greatly the transportation in Barcelona differs from Minnesota! It’s very interesting to read about how different their transportation system is. When I went to Europe, I remember how convenient and reliable their public transit was. I find it very interesting that here in American I rely so much on having my own vehicle to drive but I wouldn’t even be able to imagine trying to drive around in Europe. I hope your trip is going well! For me is amazing how every city’s transportation portraits the culture of the people in that place. 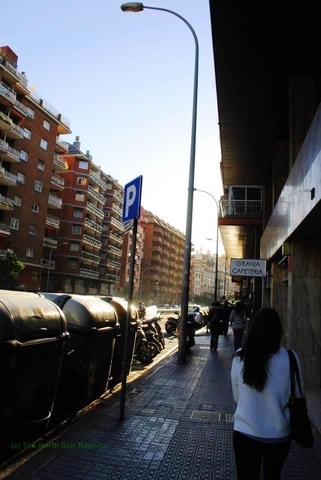 In some cities in my home country, is very similar to Barcelona, since we walk and are outside all the time. Is also for me very impressive how Europeans countries have such sophisticated transportation system, and in a price affordable for the citizens. While reading your post, I could totally relate with how you use public transportation. In my home country, most people use public transportation and it is pretty much similar to Barcelona. For a moment, your post took me back home. Thanks for sharing. I never really got to experience public transportation until I travelled to Germany and Ecuador where its utilization seemed to be so much more prominent than in the U.S. It makes me wonder why other places decide to invest so much more into public transportation than others – more expensive cars, higher drive to become more environmentally friendly, population densities? I really like this post and it totally makes me think about the public transportation I have encountered. I have never ride in a taxi before or at least that i can remember, and i have only rode on the bus system twice so i feel that i am pretty new to this transportation thing. That’s great that you were able to experience that! I feel not everyone is able to realize how important public transportation is. Until they all of a sudden need a ride somewhere. That is way of putting it when its more flat then the hills in Duluth. I think in America we take for granted our cars that we own. In big cities today though, you can see more people are taking bus, bike, or just walking. Very cool to see how our society is changing that way! Maybe one day a majority of the United States will get “on board” the idea of having a stellar public transportation system. What I found in my time walking the streets of Barcelona was the amount of electric buses and other forms of transportation. Thus, not only is they transportation system more developed by it has a much smaller impact on the environment. Generally it seems like most other countries put us to shame when it comes to walking places. Even when I go for a run on the Lake walk in Duluth I end up driving down and parking at Perkins instead of walking or running a few extra miles. At least our town now has a lot more bike lanes. Thanks for sharing this tidbit on transportation in Barcelona. I wish there was more options for public transportation in Minnesota. It would help a lot if people get around. Thank you for sharing! Here in Duluth it doesn’t seem so easy to get around. Being able to enjoy the scenery as you take a long walk is always a beautiful site! It’s always interesting to compare modes of transportation because there is always something that is different then we are used to. Good thing they had the buses so you could get to class on time and not have to run the whole way, that would have been brutal and probably would have left you out of energy for your test. Its was really interesting to read about different transportation around the world. I wish Minnesota had a better way of transportation more like the countries in Europe. This is a new perspective for me on public transportation. I knew previously that buses and subways were much more commonly used in Europe and other parts of the world, but the combination of my strange class and work schedule along with the bus times here in Duluth, it was rather hard to fathom. It did surprise me that you reported that taking a cab was roughly the same price as taking a bus! As much as I’d love to walk everywhere, the hills and blistering winter winds in Duluth don’t really make that a possibility (especially since I live rather far away from work and campus). This is a very neat article! That’s great that Barcelona boasts their public transportation and that’s a lot different from here in Duluth where most people have cars of their own. I also really like the idea of the bikes that they are able to use. The transportation sounds like a madhouse compared to the transportation like here in Minnesota. But public transportation is very convenient to have where as in most of the United States having your own vehicle is almost essential. Although you don’t see it used a lot around Duluth, I think public transportation is a great idea because it can save people money and it can also help the environment. 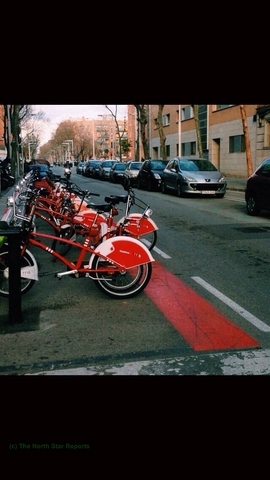 I also like the biking system you mentioned; I wonder how safe that must be in Barcelona. It sounds like you had a rough day getting to class! Public transportation is an innovative and easy way to keep a city alive. If you think about how much money could be saved, or how much carbon emissions could be reduced. It makes you wonder why it isn’t more popular especially in this country. The biking system you mentioned also is an interesting way to not only get people active, but to get them to the places they need to go. The only thing I wonder is how often do you think one of those bikes gets stolen? I hope cities in the U.S. continue to readopt public transportation. It is my observation that public transportation was huge until cars become widely available, then it fell. But a resurgence is occurring. At least that is the case in the Twin Cities as there are always expanding railways for passengers. Love your article! I love the use of public transportation and really wish that America would use more forms of public transportation. I know in more rural areas this is unrealistic but America values their big trucks and sports cars too much to give them up to public transportation. I think there is a negative connotation given to public transportation in the US which leads to less people using them. I hope some day, the US adopts more forms of public transportation. The part on public transportation was great. It really opened by eyes too how many people use public transportation. I know in the big cities public transportation is very big but Im from avery small town and we have no public transportation. Sounds like Barcelona has quite an effective transportation system. I like the idea of buying one ticket and using it for all three transportation systems, seems it would make things a lot easier. It is also wonderful that people like to walk and ride bikes. This is a good habit for any city dweller to develop since it is convenient and also good for the environment.